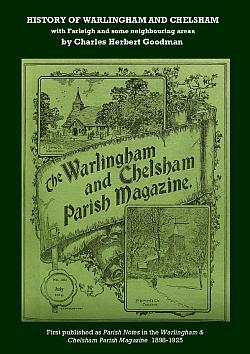 First published as Parish Notes in the Warlingham & Chelsham Parish Magazine 1898-1925, and providing a comprehensive history from earliest times until 1925. This collated edition has been compiled by Robert Warner and Gwyneth Fookes, 2012. Between 1898 and 1925 Charles Herbert Goodman published a monthly series of PARISH NOTES in the Warlingham & Chelsham Parish Magazine, with the encouragement of the then Vicar, Revd. P R Marriott, who ‘was desirous of recording matter of local interest in his newly-started (1895) Warlingham & Chelsham Parish Magazine.’ At the outset little did Goodman realise that his notes would continue for 328 editions, extending over 27 years, covering an immense range of historical and topographical subjects from earliest times right up to the 1920s. At the same time Goodman realised that the casual nature of the Notes necessarily meant the absence of any systematic plan, as unexpected information came to hand throughout the many years of publication, and this he endeavoured to correct to some degree by collecting the various papers and source material in a series of NOTEBOOKS, together with volume indexes and a general index. Recognising the immense historical value of Goodman’s Parish Notes and Notebooks, in 2006 the Bourne Society undertook to photographically copy all Goodman’s Notebooks, and to compile the Parish Notes into a single volume. In Note 328, Goodman expressed the wish that ‘some one would now continue these notes by tracing the economic history and development of the district, for which they might form a groundwork, and thus provide the editor with fresh ideas and matter for the magazine.’ This does not appear to have happened, but much further information may be found in Bourne Society Village Histories 4: Warlingham (1999), edited by Dorothy Tutt, (ISBN 0 900992 47 6); in Bourne Society Village Histories 8: Chelsham & Farleigh (2004), edited by Roger Packham, (ISBN 0 900992 64 6), and in the Society’s quarterly Local History Records.